It seems hard to believe but we started our 10th day of the trip this morning. It's been a really good trip (except for the tire blowout) and we are still enjoying the trip and each other! We started out just before 7:00am this morning for our 393 miles of driving for the day. Our morning Bible hour was John 5-12. 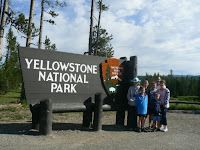 We drove to Yellowstone National Park through the southern entrance which comes through Grand Teton National Park. 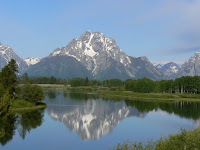 We didn't originally have the Grand Tetons on our itinerary but are so glad we changed our itinerary to include them. The only negative to our trip into Yellowstone was the 6 miles of single road construction just before the park and it's half hour delay. We finally got into the park and headed immediately for Old Faithful. It took about an hour to get there from the south entrance and we didn't stop anywhere on the way because we didn't want to miss an eruption. They list the eruption times at the Visitor Center at Old Faithful (which doesn't help until you get there) and by phone call (but there is limited to no service in the park). 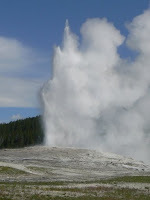 We go to Old Faithful at 10:37 and the next eruption was listed as being within 10 minutes of 10:49. What great timing! The eruption happened around 10:52. It was great - we loved it, the crowd loved, God is great! We enjoyed the 3+ minute eruption and then waited for the crowd to thin out before hitting the Visitor Center (and bathrooms) and a couple of gift shops in the area. From there, we went back towards the south entrance and stopped at the Kepler Cascades. We were planning on going out of the park through the North entrance but our GPS wanted us to go out through the East entrance. Are we glad we didn't listen to our GPS! Soon after passing the East entrance, we came across 5 bison grazing alongside the road. We had seen 1 bison earlier but he was far from the road and barely visible. These 5 were up close and active. We stopped and took some pictures and then headed on the road. 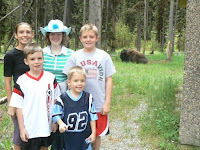 We hoped to find another bison - 7 bison for 7 people in our family. Shortly, we came across the guy in the picture with the kids. He was sitting at one of the rest areas in the park and we stood about 15 feet from him. In all, we saw about 80 bison in the Park and about 40-60 more on farms right outside of the park. 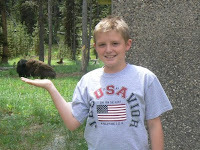 Most were adults but Jordan found this little guy he could hold in his hand! From the Park, we travelled to Billings, MT. We had dinner at Fuddrucker's (a restaurant Lisa and I went to when we were dating). Another great day of traveling and enjoying our family together! Tomorrow is Jedi's birthday - hard to believe that our baby will be 8. I hope our on-the-road celebration is one he enjoys! Happy Eighth Birthday Jedi! We hope this is the best one yet.